This works in corporate life as well, heck someone made money on the pet rock. At a slightly higher level I had an experience with an ERP project that was committed to using Standard Cost. They really thought it was the best way forward, because they manufacture products and a lot of the components are the same in multiple projects. The problem was that most of the projects are user configured, like building your own computer, and there were discounts and variances depending on the supplier and the end user. Because of this, there would be a lot of journal entries every year that needed to be adjusted in order to properly account for cost. The simple solution was Actual Cost. Since most of the items were configured at the front end of the system, and costs rules could be set in the system to manager the discounts and variances, it would eliminate the need for journal entries at the end of the year. Significant savings. The idea met immediate resistance. They didn't want it. Now to their credit, they didn't come right out and call it stupid, but we ran into the battle buddy of "It's stupid" and that's "We've always done it this way." They discounted the idea of Actual Cost because they were comfortable with Standard Cost and the process associated with the journal entries. They already had the staff for it, and the Finance Director came from a manufacturer who made the exact same widget 100,000 times a month. Working with operations, and regional finance managers, we started to build a ground swell for change to Actual Cost. Business cases were created and presented, and eventually the Finance Director acknowledged the improvement. The basic of this Law is to look for the simple solutions first. Don't discount suggestions out of hand, and just because you've always done something a particular way doesn't mean you should always do things a particular way. When you have a problem (as in so many of Morey's Laws) take a step back and think. What is the root cause of the problem? Is there a solution nearby? 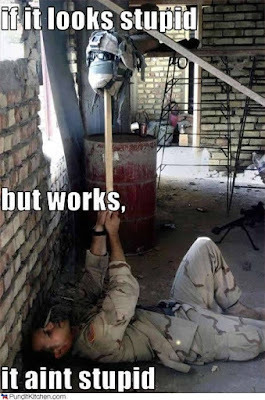 How long will it work? How long does it have to work? And please please please ask your team for their ideas too! More people mean different ideas. Then go through the same process. As with a brainstorming session (and you might decide to start with a brainstorming session) don't discount any idea, just get them out there first. Then you can look at the details and choose a course of action. Granted this solution works, but it puts too much at risk. 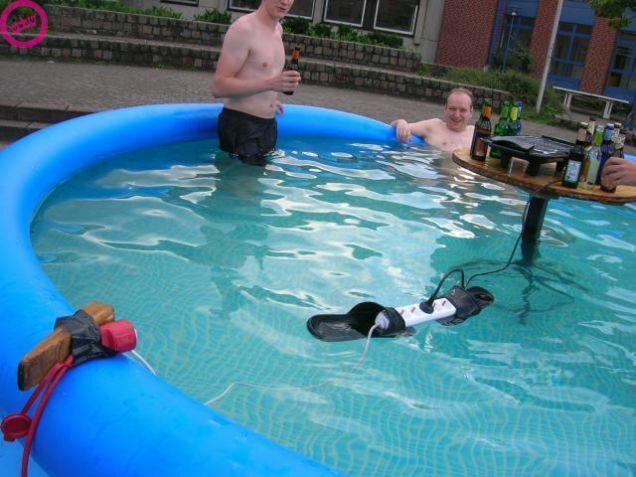 As soon as it doesn't work, everyone in the pool could be electrocuted. I did have one person point out that they are using a surge protector, and thus it should trip the moment the outlets hit the water, but are you willing to trust your life to that? I've known too many surge protectors that didn't operate the way they were supposed to! When working out your own solutions, take the time to determine if it is a solution, or is it just an invitation for something worse. I would love to hear what experiences you had with stupidly simple solutions that worked. Please comment below, and who knows, I might feature it in a future blog!